It’s always fun when we can go back to a location for a new version of a room we have previously escaped (whether we liked the room or not). It’s honestly one of the things I look most forward to (but unfortunately most locations don’t make this scenario a reality). Room Escape DC has consistently provided us with solid games/stories and experiences that we talk about because they were a lot of fun. So when Andrew asked us to come check out the revamp of Save the White House (henceforth abbreviated as StWH), how could we resist? 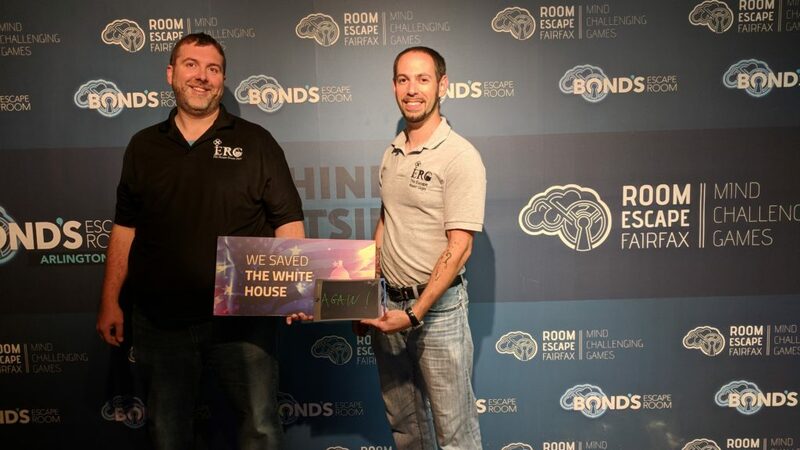 Room Escape DC in Fairfax is one of our favorite locations because the rooms are fun and there is a lot of thought put into the puzzle types. When Andrew, one of their Game Masters, contacted us to let us know that one of their original rooms had been revamped, we jumped on the opportunity to check out the reboot. Save the White House was the first room that Jason and I attempted just as the two of us (without our team of Disturbed Friends) and completed, so it was cool to be going back and see if we could get history to repeat itself. Hackers have broken into the computer system controlling the country’s nuclear arsenal and are arming nukes and pointing them at major US cities. As Secret Service agents, it is our responsibility to neutralize the threat to national security and save the country. Not a lot of detail in this one. One thing I’m not sure is technically accurate is why we’re Secret Service agents and not FBI agents, as it’s the FBI that would handle counter-terrorism, not the Secret Service. But I don’t work for the government, so there’s the (small) chance I could be wrong here. Rating: 6/10 Hackers have somehow gained control of the country’s computer system that controls the launch sequences of our nuclear arsenal. They are initiating a launch sequence, which will destroy a number of major U.S. cities. As we are Secret Service agents in charge of securing the White House, we’ve been brought in to eliminate the threat. The concept of saving the world from a nuclear attack isn’t fully original, but the hacker element in the Oval Office is a nice spin to it. Additionally, they provide you with an adequate backstory, so that it starts to get you into why you’re in this predicament. See my Flow rating for more info as to how everything integrated into the overall mission. One simple goal – stop the attacks from happening. I would have liked to possibly have had to find out who did the hacking and why. That would have added a little more depth and discovery to the room, as well as a little more difficulty. This room is easier than the original, so maybe they deliberately chose to keep it simple. But you know how crazy we get about the Story and Mission ratings, so just keep reading. Rating: 7/10 As the Secret Service agents in charge, we have to find a way to regain control of the computer system and stop the launch of the nuclear missiles before millions of people are killed… including us since there are a number of them aimed at Washington, DC and, specifically, the White House itself. Let’s hope that bunker underneath has a lot of room and is well built! As with StWH1, there were plenty of seemingly random items strewn about the room. The only things I remember seeing from the first room were the desk and the fireplace (ok, and the flags). If you played StWH1, you’ll not be doing the same thing with the fireplace, I can (and just did) tell you that much. It’s actually much trickier this time around. There’s plenty to open (there are a handful of combo/pad-locks) and some finicky magnets, but all in all it’s well done. I particularly enjoyed the ducks. (quack quack) I would say, however, that there was more tech in R1 of this room. One thing I want to point out is that this room has a really good amount of deductive reasoning in it. Things may not seem like they go together, but it’s up to you to figure out which things do. Rating: 9/10 There are a lot of puzzles in this room (given that it’s their largest room and geared towards families and bigger groups), and there is a lot of space to look around and search for your starting point. There were a fair number of locks and items you needed combinations for, but they all fit what you could consider would be in an executive government office. I also liked that they integrated items from the country vs. just specifically DC-based… just make sure that you look closely at everything you do find. One puzzle requires some concentration and I’d say just stick to it as you’re trying to solve it. The mechanism was a bit finicky but we got it to work once we confirmed with Andrew, our GM, that we were – in fact – doing the puzzle correctly. There are also a few puzzles that relate to just plain common sense. Don’t overthink it. Picture the way the items would be used and that’s the key to solving that part of the puzzle. Finally, there was a good mix of the types of locks you’ll find in this room, which we’ve come to expect from Room Escape. You’ll find a few standard combo locks, but there are some other cool tech things as well, in addition to simple puzzles that you can easily overlook or overthink. You hear us say nothing was ‘terribly difficult’ or ‘overly difficult’ pretty frequently because, generally speaking, the issues we have are just cases of us either overthinking or overlooking things. StWH2 was actually the first room in a while that we didn’t use any clues. (I think Mike and I have known each other long enough at this point that we can compensate for each other’s lapses in thought so that we don’t necessarily need a clue. Also, I hate getting clues.) We were able to move pretty quickly from one thing to the next, only stumbling momentarily while we tried to figure out what to do with some things. The difficulty here ranges from probably a 2-6/7. So not a terribly big spread but as I said earlier, this is an easier room. Rating: 8.5/10 For this one, we actually found that the room was a bit easier than its predecessor, which we found out later was by design since this is their largest room and the one that families with kids do most often (or are used for larger parties for kids’ birthdays). It’s not that this room is “easy”… far from it. Jason and I have just done a number of rooms together where we are able to play to each others’ strengths. I am a bit better on puzzles that require longer periods of concentration, while Jason is good at puzzles that require the leaps of logic to solve them quickly. That being said, there are a number of things that you have to concentrate on and figure out how to put together. People who get distracted easily may find parts of this room very difficult. Communication skills will also help you here, especially if you have a team that you can bounce suggestions off of. There was a point where we were stalled, but then I saw a solution I wanted to try (using that level of common sense). Jason stepped back from trying to solve the puzzle as well and listened to my idea, and then took it from there and we solved the puzzle within minutes. What I enjoyed most about StWH2 was the way everything in the room was used and pointed you in a direction throughout. Sometimes we find that you come to what appears to be a dead end and you hop on the struggle bus while you try and figure out what to do next (and honestly, this happens mostly to Mike when he’s doing rooms without me… *snicker*). The room itself was sparsely decorated but what was there (mainly furniture) was used appropriately and didn’t detract from anything. Being that you’re in the Oval Office and the room is ‘L’ shaped doesn’t really throw much off. Similarly to StWH1, things you find may not be used where you find them, and I particularly enjoy having to move things around and figure out their uses. That’s not terribly difficult here. One thing of note, however, is that the puzzles don’t progress in relation to the theme of the room (I don’t recall much of anything we found pushing any details of the nuclear arsenal issue any). So as I said earlier, don’t go looking for much depth to the story. Rating: 7/10 The room, once you walk in, is deceptively “empty” as in there are not a lot of items to search through. You have to find a starting point and then move forward from there. Once you do, it flows well and each successive puzzle takes you to the next – but you have to find out where it goes and how to piece other elements of what you find together (in addition to the obvious puzzle elements). The elements in the room all relate to politics and the government, but there isn’t a lot of “tech/nuclear” items that you would think would relate to stopping hackers. There ARE a few, but the entire room doesn’t center around hackers, so just keep that in mind when you are doing the room. The room does flow well and you’ll be able to navigate it pretty easily. The decoration fits the room and the theme (politics and the Oval Office) and the nuclear/hacking theme does emerge as elements of this. I think the design also pokes some fun at the current administration (and past ones) in one of the puzzles. I actually laughed at parts of the puzzle once we found them. This room was certainly enjoyable. Since Mike and I had done StWH1 as our first room with just the two of us, we decided to repeat that for R2. No running around or throwing things (but as I said in the post-video, there was some power walking). It’s always fun to do a reboot of a theme you’ve already completed. While this one was “easier” (and I’ll chalk that up to the room design being easier as well as Jason and I having 60+ more rooms of experience by this point), it was still a fun room to do. If you are pretty experienced enthusiasts, you could probably do this room with 2-4 people. Andrew knows us well enough to just chime in if we’re doing something right and the tech is glitching or just to answer when we ask, so he was good in that respect. Andrew was great, but he knows us and how we like to do rooms so he was pretty hands off unless we asked a specific question. We didn’t use any, sucka! We didn’t ask for any clues… just a clarification that we were doing something right when there was a very small glitch with one of the puzzles we were working on. Nothing to report here, so big fat 0. Rating: 0/5 Fists Nope… nothing made me feel stupid here, so this gets a 0. Final Thought: We’ve enjoyed doing the rooms at Room Escape, primarily because we know they put a lot of thought into them. When Andrew invited us back to do the reboot of the first room we did on our own (as just the two Escape Room Guys), we jumped on that pretty quickly. While it was a bit easier than the first one, we still had a good time, and the room did test our teamwork and communication skills.